The Delay In The FBI's Clash With Apple: What Does It Mean? 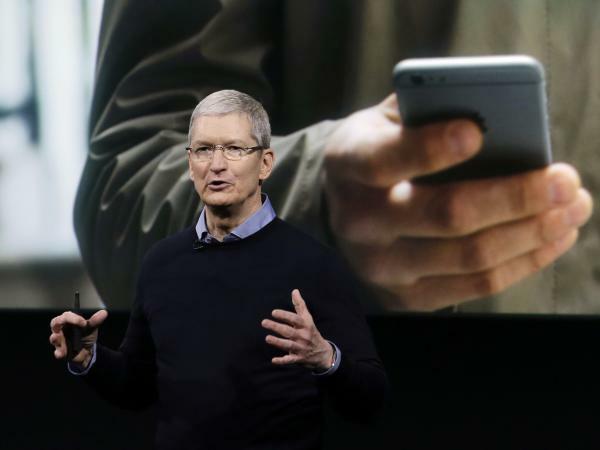 Apple CEO Tim Cook introduces the latest version of the iPhone on Monday in Cupertino, Calif. The company's legal fight with the FBI may be at an end, or at least a detente, if a third party's suggestion lets the agency hack into the San Bernardino shooters' encrypted iPhone. The FBI may have found a new way to crack into the locked iPhone of one of the San Bernardino shooters — a method that doesn't require Apple's help. This is a major new development in the increasingly heated debate between the tech giant and the government, which has argued that Apple should be compelled to write new special software that would override some security features. That was the only way, investigators previously had said, that they could crack the phone's passcode without jeopardizing its contents. Below are some of the main issues Monday's development raises. Is this the end of the court case? The FBI's request for the delay does not immediately end the litigation, only pauses it. Apple is not claiming any victories yet, and some legal experts also cautioned against jumping to conclusions. But Nate Cardozo, a lawyer at the civil liberties advocacy group Electronic Frontier Foundation — which supports Apple's position — says this marks a pivotal point. "This filing today represents the FBI completely backing down on this particular case," Cardozo says — but "there may be another case in the future." What is the tool the FBI is trying? The FBI says an unnamed third party has shown it a new alternative, which the agency wants to test. A status report is due by April 5, meaning a testing time of about two weeks — which suggests the test is not too experimental, says forensics researcher and iOS security expert Jonathan Zdziarski. What happens if the new tool does work? "For Apple, it proves their case that the FBI should be trying harder, rather than asking Apple to undermine its security protections," says Susan Landau, a longtime cybersecurity expert at Worcester Polytechnic Institute. "For the FBI, it's certainly an embarrassment to have gone to this effort in court when there was another route — but it also points out the need to develop the expertise, both the technical expertise and organizational expertise." Cardozo says that if the FBI is successful at cracking into this phone, it undermines law enforcement's big worry: that its investigative avenues were "going dark" in the digital age. George Washington University law professor Orin Kerr says neither side would emerge unscathed. "The FBI looks bad because they had a way into a phone and they didn't realize," he says, "and Apple looks bad because they said the sky would fall if they created a way into the phone, and there was a way in this whole time." Successful entry also would mean, perhaps most critically, that no legal precedent will be set for either the law enforcement or the tech community. "If the government can get into this phone, it just kicks the can down the road a year or two," says Kerr. "Apple will presumably correct [any old vulnerabilities], and then in a year or two there will be the next case, and we'll be where we thought we were yesterday." What happens if the new tool does not work? "We go back to where it started," says Kerr. The case likely would have to proceed with hearings and appeals, as originally expected — though the FBI's position might be a bit bruised. "If they thought [the new approach] was plausible enough to pull off the case, I think it says they haven't tried everything," says Landau. "One can't try everything, of course — but have they tried a reasonable amount for what they expect to get off the phone? That's the question." Where does the debate over encryption go from here? That question will be unanswered until there's either new, direct case law or new lawmaking in Congress. "I think what this means is that the next battlefield in this war is going to be in Congress," says Cardozo. Landau says that, no matter how this case wraps up, the developments highlight the major point she's been making: that the FBI needs to step up its technological game. But she sees an important transformation already underway, thanks to this case, in how Americans view government access to data and encryption. "The conversation has shifted slightly from national security vs. privacy to more a security vs. security discussion," she says.